Resolved to Get Healthier Last Month? Did You Consider a Pet?! Resolved to Get Healthier Last Month? Did You Consider a Pet! Right behind the Times Square ball drop came the New Year’s resolutions to get healthier. We promised ourselves this is the year we’ll exercise more, eat less, go to bed earlier and meditate. If your goal truly is better overall health, you may want to add “get a pet” to the list. There’s a wealth of science to support the physical, psychological and emotional benefits of loving and being loved by an animal companion. But many people aren’t aware of the extent to which they can contribute to our well-being. Get moving! The most obvious benefit is the activity that comes with caring for your companion, especially dogs: walking, hiking, running or doing agility drills with Fido promotes a more active lifestyle. Published studies have found that children with dogs spent more time on moderate to vigorous physical activity than children without dogs, while adult dog owners walked an average of 5 hours per week vs. non-owners who clocked only 3 hours per week on average. Walking other pets – I knew a woman who walked her enormous pet rabbit on leash around downtown Chicago – may provide more moderate activity increases. But it’s all about the movement required by – or inspired by – our animals. Whatever it takes! It’s the heart of the matter. Pets can reduce your stress levels, resulting in decreased blood pressure, cholesterol and triglyceride levels according to organizations such as the National Institutes of Health and the Centers for Disease Control. This, in turn, can lower overall risk of heart attack, and speed the recovery process of heart attack patients. For cat owners, the risk may be lowered by as much as 40%. For dog owners, the statistics are equally compelling: Research shows if you’ve had a heart attack, owning a dog can increase your odds of survival from 1 in 87 to 1 in 15. Less sneezy, less wheezy? While it may seem counterintuitive in a world where more and more children are being diagnosed with allergies, scientific research suggests that exposure to cats and dogs in the household during infancy may decrease a child’s likelihood of developing allergies and eczema by helping the body fight off allergens. One study showed a decrease in allergy development related to cats of 33%. Other studies have shown that babies exposed to two or more dogs or cats were up to 77% less likely to develop allergies to dust, grass, ragweed and pets and were at a lower risk for asthma. This may tie into findings that children living on farms develop fewer allergic diseases. According to the American Academy of Allergy, Asthma and Immunology, one theory is that farm animals increase exposure to endotoxins, which stimulate immune response and decrease allergic inflammation. Let me ease your mind. Pets aren’t just good for the body, they’re good for the soul. 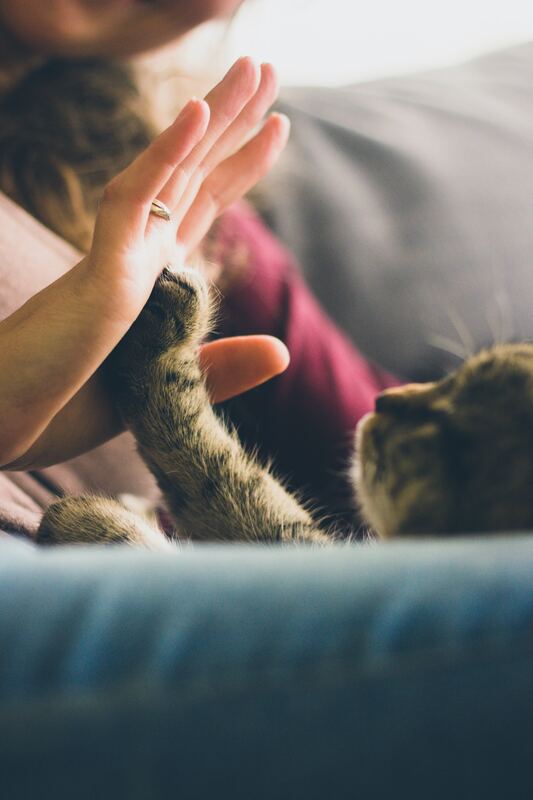 There are numerous studies showing the psychological and emotional benefits our pets bring, including a calming influence, providing a sense of purpose and achievement, promoting socialization and helping alleviate feelings of loneliness. Pet parents have always understood that their pets make them feel happy, but science helps us understand the “how” and “why,” and even the “what”. For example, who knew that smiling when your pet does something cute has health benefits? It triggers neurotransmitters that can raise serotonin and dopamine levels, which are associated with calmness and happiness. Or that staring into your dog’s eyes can increase levels of oxytocin in the brain (in both parties). This is the body’s “feel good” drug or the love hormone, which increases feelings of well-being and strengthens the bond between dog and human. The benefits list grows longer each day — and that’s just for the average human. It doesn’t even touch on the amazing dogs and cats that sniff out disease, alert their owners to imminent medical crises or help them better cope with conditions such as ADHD, autism, PTSD or Parkinson’s. The bottom line is this: Pets can contribute significantly to a person’s overall health and well-being. If you love animals and are ready for the commitment, a pet may be your ticket to a healthier 2018.